We were in Victoria, British Colombia a few years ago. It is a wonderful city and is particularly beautiful at night. I enjoyed walking around the waterfront. We were there for 2 days and one night. This photo was taken after we had done an evening horse-drawn carriage tour around the city. This is the second time we’ve been to Victoria and we will both be glad to visit again. Have a beautiful day today my friends! Your caption on this fine image brings back memories of the late and great Otis Redding ! Lovely colours and light ! 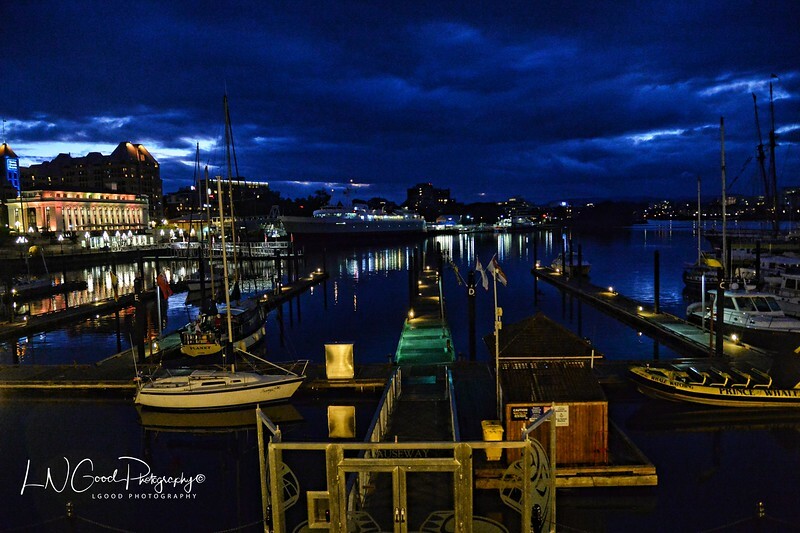 Ditto on Victoria, what a beautiful city and a great shot of the harbor. Well done young lady. Spectacular blue sky in this twilight shot. Great night shot, Linda. This is awesome. Dallas was brutally cold this past weekend and I am glad to be home.